This uniquely crafted iridescent blue masterpiece features 360 diamonds woven in its build, gold plating throughout and the world's first motor lit from the inside. 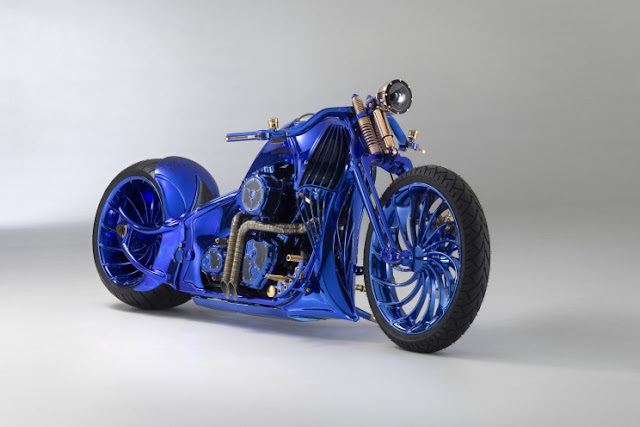 This bike is created by Bucherer and Harley Davidson Bündnerbike which they collaborate the world's most expensive motorcycle called the Harley Davidson Blue Edition. The shiny blue motorbike costs a swapping US$1.9 million and comes with two free watches and a ring integrated in its body. The ostentatious vehicle boats 360 diamonds woven into its build and gold plated screws. 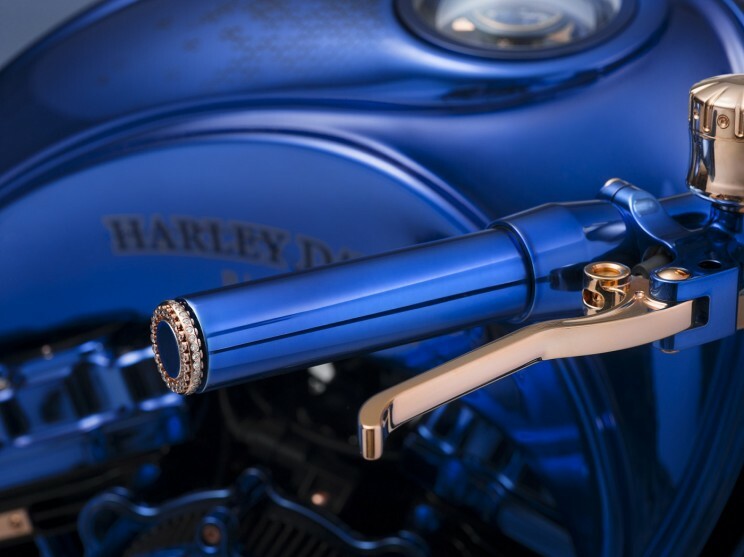 Its iridescent color is the result of having applied six coats of blue paint over the bike’s silver plated body. Embedded in the tank are watch and ring holder cases featuring armored glass domes. The cases are also LED lit, rotating and are rigged to isolate their contents from vibrations. If that is not enough, the ring provided with the bike is a six prong Heaven solitaire featuring an impressive 5.40 carat diamond. The watch housed on the other side of the tank is nothing less than a custom-made Bucherer creation based on the ultra-modern Patravi TravelTec II model. The watch's case doubles as a winder ensuring the watch remains fully wound at all times. The bike also boats the accolade of being the world's first motorbike with a motor lit up from the inside. Blue Edition's 100PS motor has been carefully equipped with heat resistant LEDs. To build this unique and exorbitant machine, designers began with a Harley Softail Slim S and replaced all its parts by essentially works of arts “produced, welded, beaten, ground and polished by hand.” The company said the process saw eight people put in 2,500 hours of labor. The designers implemented a hole in the engine cover that provides a LED it view of the bike’s camshaft and gold plated throttle valves. The headlight, hand levers, front springs as well as shock and shotgun exhaust pipes are all decorated with rose gold plating. Meanwhile, Bucherer diamond encrusted rotating Dizzler rings can be found on the tops of the fork tubes and handlebar ends. Last but not least, the bike features gold plated ensuring the vehicle is indeed decked in luxury from head to toe. Only 45 copies of the exclusive automotive masterpiece have ever been produced. Although the bike did start off at the bidding of $110,000 it was reportedly eventually sold at 100 time that amount.